With their fantastic profitability and ability to fund consistent dividend growth, these 3 top tobacco stocks deserve the attention of investors looking to add so-called "sin stocks" to their portfolio. Though you can rarely say this in investing, it is in fact good to be bad when it comes to so-called "sin stocks" like tobacco stocks. Potential moral qualms aside, tobacco stocks have enjoyed something of a moment of late; many of the largest tobacco stocks have outperformed the S&P 500 over the past year. So what are some of the top tobacco stocks on the market today? Generally speaking, the 3 best tobacco stocks on the market are Marlboro-maker Altria (NYSE:MO), international cigarette stock Philip Morris International (NYSE:PM), and the second largest tobacco company in the U.S. Reynolds American (NYSE:RAI). Here's a quick snapshot of a few of these tobacco stocks' key metrics. Though similar to a certain degree, the investment outlook for each of the above tobacco stocks is by no means uniform. As such, let's drill deeper into the specific investment rational for Altria, Philip Morris International, and Reynolds American. The seminal sin stock, the dizzying performance of Altria over the past 30 years -- more than doubling the S&P 500's annual return for three decades -- shows successful investing doesn't require reinventing the wheel. Thanks to its dominant portfolio of cigarette and smokeless tobacco brands including Marlboro, Altria produces consistent annual profits that it passes along to its shareholders. Even with use of tobacco products at a 50-year low, Altria's outlook remains surprisingly favorable. Today, the average analyst rating for Altria stock remains a buy in large part due to the company's ridiculously profitable margin structure. Thanks to the aforementioned secular declines in smoking rates and tepid overall growth in the U.S., Altria's sales growth outlook isn't impressive. Analysts see its sales this year and next year increase at scant 2.7% and 2.4% rates respectively. However, its roughly 50% operating margins give it the operating leverage for minuscule sales increases to translate to outsized gains in profit margins, which is exactly the case for Altria. The above sales increases are expected to correspond with EPS growth of 8.9% this year and 9.2% next year. It's this tried-and-true playbook that figures to continue to make Altria a dividend investor's dream well into the foreseeable future. Spun off from Altria in 2008, Philip Morris International's exposure to higher-growth emerging markets makes it an extremely popular option among tobacco stocks, particularly today. With the entirety of the company's revenue base lying outside the U.S., the resounding strength of the dollar has hamstrung Philip Morris International's results in recent quarters far more than any operational issues. As I mentioned in a recent piece on several top defensive stocks, foreign exchange headwinds have negatively impacted Philip Morris' results for eight consecutive quarters. All told, the rising U.S. dollar has erased an astounding $6.8 billion from Philip Morris' top line over this period. However, the good news -- and a recent source for analyst upgrades -- is that many expect the U.S. dollar's strength to eventually moderate or reverse. When it does, Philip Morris' incredible economics will once again shine through, which analysts believe could have tremendous benefits to this top tobacco stock's share price. 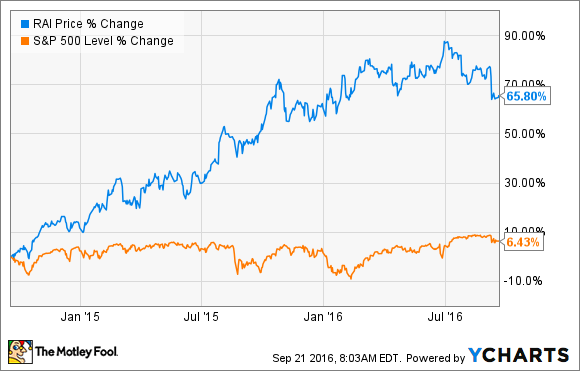 It's been a fantastic two years for tobacco stock Reynolds American, the second largest cigarette company in the U.S. Thanks in no small part to its savvy acquisition of then-rival Lorillard, Reynolds American's stock has handily outperformed the market by roughly a factor of 10x. However, the chart also reveals a more recent weakness in Reynolds American stock price, largely the result of a late July earnings miss. Digging deeper into this disappointing earnings report reveals what was, for the most part, an impressive quarter. Sales rose 33% to $3.2 billion thanks to new revenue from Lorillard, but still fell slightly short of analyst's expectations of $3.26 billion. Reynolds's companywide U.S. cigarette market share also increased to 34.5%. Non-GAAP EPS increased from $0.51 to $0.58. Looking at these largely positive figures, it's hard not to chock this earnings "disappointment" up to the myopia that comes with following analysts' expectations to their exact dollars-and-cents amounts. Operationally, things seem to be going quite well at Reynolds American today. Taking the cigarette stock in its broader context, Reynolds American's stock appears fairly valued but still compelling. Trading at roughly the same forward P/E and forward dividend rates as its slightly larger rival Altria, Reynolds American shares don't necessarily appear patently undervalued. Rather, the tremendous economics of the tobacco industry as a whole should enable the company to continue to experience continued EPS and dividend growth well into the foreseeable future. Leaving the possible moral reservations to each individual, it's hard not to like the compelling financial results tobacco stocks are capable of producing for investors.